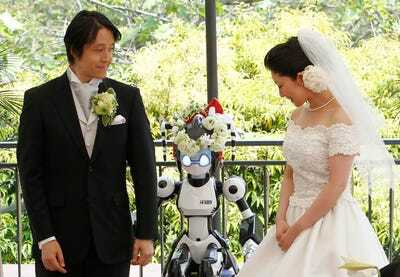 People may be getting married later than ever, but that doesn’t mean weddings are getting more staid. Reuters has rounded up photos of some unusual wedding celebrations around the world, featuring couples tying the knot underwater, dangling off a cliff, and everywhere in between. Paige Cooperstein wrote an earlier version of this post. Sergey Kaunov, a member of a local winter swimmers' club, carries his bride Irina Kuzmenko out of water as they celebrate their wedding on the bank of Yenisey River where the air temperature was about -22 degree Fahrenheit in the Russia's Siberian city of Krasnoyarsk. 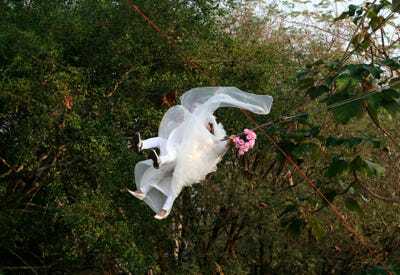 A Thai bride and groom fly while attached to cables during a wedding ceremony just before Valentine's Day in Prachin Buri province, east of Bangkok. Yelena Babkini and her husband wave as they ride through Gorky Park on bicycles after having been married earlier in the day in Moscow. 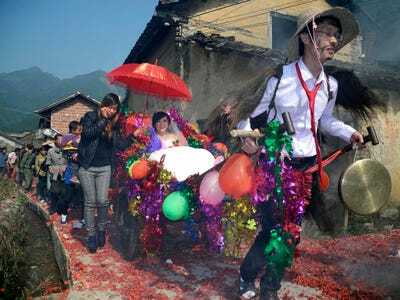 Newlywed groom Meng Jun, 29, pulls a cart carrying his bride Zeng Shuangying, 25, during a traditional wedding ceremony in the Guangxi Zhuang Autonomous Region of China. 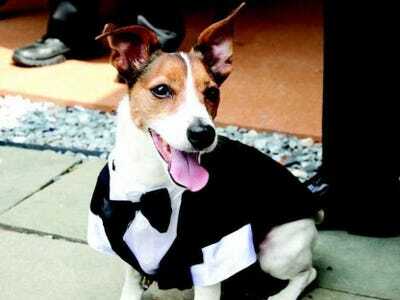 Many locals still follow the tradition of carrying out pranks to make fun of newlywed couples, including preparing costumes for the groom, painting his face with ink, and setting barricades for the cart he has to pull. 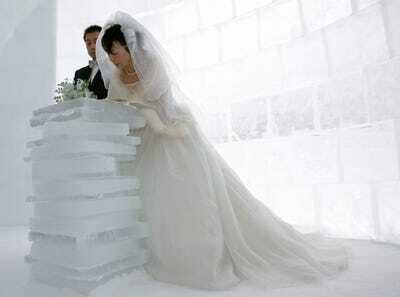 Akemi Kito and Hiroshi Matsuoka wed inside a chapel made of ice at the 'Igloo Village' on Lake Shikaribetsu on Japan's northern island of Hokkaido. During a mini-marathon celebrating the New Year, grooms run with their brides in Sanya, in south China's Hainan province. A bride and a groom sit on a beach in Lima before a ritual with shamans for Saint Valentine's Day. 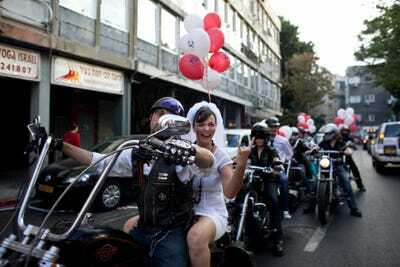 Yulia Tagil sits on the backseat of a bike as she arrives for her wedding ceremony in Tel Aviv. Fang Jing hangs off a cliff next to her husband in Liuzhou, Guangxi Zhuang Autonomous Region in China. Joey Bayo and his wife Lea plant a mangrove tree after their wedding in San Jose town, Puerto Princesa, Palawan city, western Philippines. An engaged couple poses on a pedestrian bridge on Valentine's Day in central Beijing. 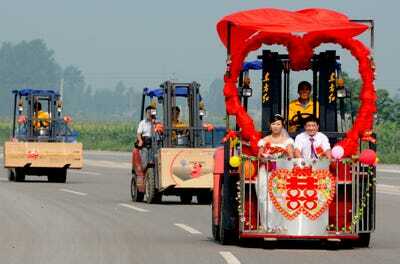 Kong Qingyang and his bride Shen Likun sit on a forklift-turned-wedding car in Xingtai, Hebei province in China. 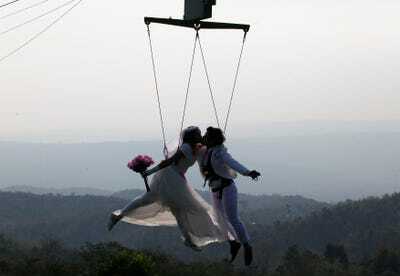 Prasit Rangsiyawong and his bride Varuttaon Rangsiyawong fly while attached to cables during a wedding ceremony in Prachin Buri province, east of Bangkok, Thailand. 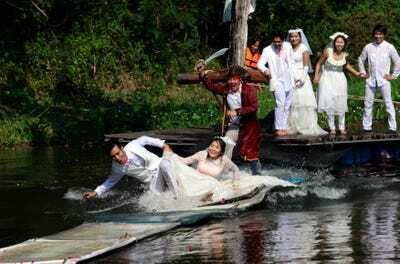 Sorawich Changtor and his bride Rungnapa Panla run to escape a man dressed as a pirate in Prachin Buri province, east of Bangkok, Thailand. 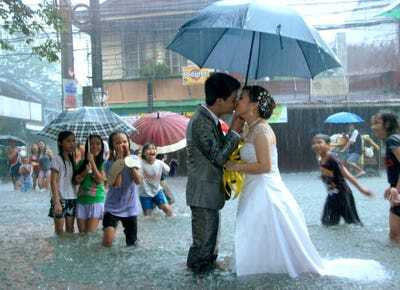 Prasit Rangsiyawong kisses his bride Varuttaon Rangsiyawong in Prachin Buri province, east of Bangkok, Thailand. Gerhard Pyper and his wife Jan stand in the English Bay after taking part in the 89th annual Polar Bear Swim in Vancouver, British Columbia. Erin Finnegan and Noah Fulmor got married in the first weightless wedding aboard a specially-equipped Boeing 727, while flying over the Gulf of Mexico. Sine Andersen and her husband Rune Jamrath wed at the World Santa Claus Congress at an amusement park north of Copenhagen. 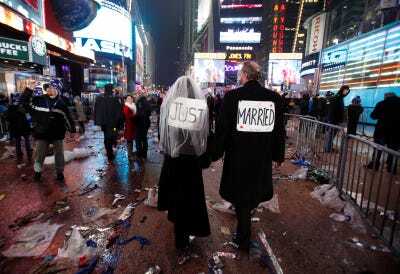 Melessa and Rick Clark exchanged vows in Times Square on New Year's Eve. 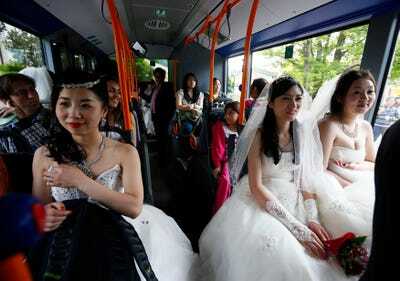 Chinese bridal couples travel on a public bus to the Neuschwanstein Castle in Germany to repeat their wedding vows. Ramoncito Campo and his wife Hernelie Ruazol Campo stand in a flooded street during a southwest monsoon in Manila in the Philippines. Marisela Matienzo and Carlos Munoz got married at a McDonald's in the suburb of San Pedro Garza, neighbouring Monterrey in Mexico. A Chinese couple poses for a wedding photo on a busy alleyway or 'hutong' in Beijing. 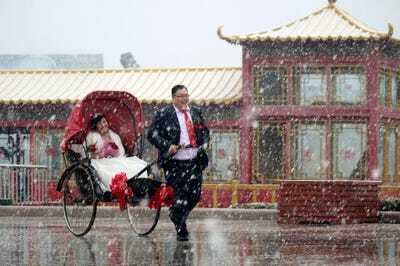 A man pulls a rickshaw carrying his wife as it snows in Weihai, Shandong province in China. Cyclists ride past these newlyweds during the second stage of the Giro d'Italia in Italy. 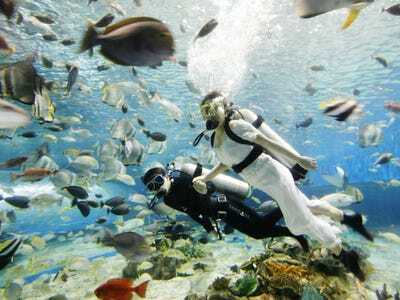 Divers pose as 'Bride and Groom' in an aquarium during an event to celebrate the month of June, the most popular month to wed in Manila in the Philippines.